Don’t miss the final lecture of the Scholarship Series sponsored by the Quail Creek Education Committee and TWOQC’s Scholarship Committee coming next Monday, March 12th. The Women of Quail Creek thank the Quail Creek Education Committee for their support in co-sponsoring this beneficial series for the Scholarship Fund. YOTO is having its Spring luncheon on Wednesday, March 28 at 12:00 p.m. at the Tucson Convention Center (registration begins at 11:30; luncheon follows at 12 p.m). 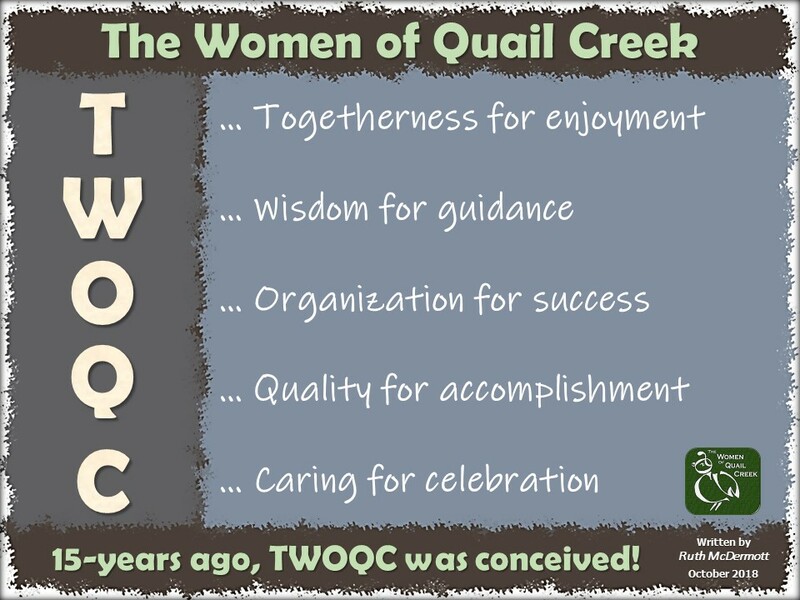 In recognition of the support TWOQC has given YOTO, they are offering discounted tickets to all members of The Women of Quail Creek. This is a terrific way to learn more about YOTO and to meet some of the students, staff and school liaisons that work with the program. Several members of the YOTO committee are attending. If you wish to take advantage of the discounted price of $35 and carpool to the luncheon, please contact Diane Quinn (yoto@womenqc.com) by March 12. Checks only made payable to YOTO. Regular priced tickets of $45 are available for purchase online at YOTO.org. We have started a waiting list for this field trip for those that wish to take the bus. Or, for $25 we will add you to the docent-led tours at each site and the lunch at The Italian Peasant — however you will have to provide your own transportation. We are using only one bus for our March 26 field trip. Members taking the bus will be divided into two groups, one touring Tubac Presidio first and the other starting with Tumacácori. Both groups will meet at the Italian Peasant for lunch and then tour the other location. This is a great chance to spend time with fellow members and to have a specialized tour experience at each historic site. To get on the waiting list or make a “provide your own transportation” reservation, contact Peggy (pjmcgee@cox.net). Deadline to sign up for the field trip is March 14th. The famous “Baby Bottles” will be making another appearance at the Friday night concert on March 16th at the Madera Clubhouse from 4:45 p.m. to 6:45 p.m. If you plan to drop by and donate, we appreciate any loose change you may have for the bottles. We currently have 28 families with room for 2 more to join. Two more babies have been born (for a total of 4 so far!) and even better news… we have a family that just found out they are expecting TWINS! The committee is still looking for donations of outfits, onsies, diapers, baby wash, baby powder, and blankets. The donation box is located in the Madera Clubhouse lobby. Donations may also be dropped off at Kathi Krieg’s porch, 2680 E Sawyer Road. Going Green for St. Patrick’s Day? If you are going to a St. Patrick’s Day party and need a hostess gift — how about a green wine tote @$4 or a green thermal tote at $7? Hosting a St. Patrick’s Day party and need a green apron? Regular length apron is $18 and the tavern length is $15. Or do you just want a Pilsner with a green quail motif @$8 for your cold beer? Contact Peggy (pjmcgee@cox.net) to arrange for pick-up. It is with a heavy heart that I report another loss of a beautiful TWOQC member, Diane Borst. A Celebration of Life for Diane will be held on Wednesday, March 14 at 4:00 p.m. in the Madera Clubhouse Crystal Ballroom. Please join friends, neighbors and family in remembering Diane whose “…greatest joy was making others happy”. In lieu of flowers, please send memorial contributions to: Honor Flight Chicago, 938 W Montana, Chicago, IL 60614. From the Photo Gallery page of this website you may access a link to the “In Loving Memory” photo album in remembrance of our members. Mark your calendars to support our war heroes! Honor Flight #24 will depart Tucson International Airport on Saturday, May 12th at 5:15 a.m. on American Airlines (send-off is at 4:00). The return flight is May 14th at 7:20 p.m. (through the gate at about 8:00). Names of the 23 on the flight will be available sometime in March. Letters “to a Hero” or “to a Veteran” may be delivered before April 30th to Kay Robinson (898 N Kenneth Drive) or brought to the April TWOQC program. We are seeking a chairperson for the VA Homeless Clothing Drive. Yes, you are thinking there is a lot of work to do for this position, but please know that there is a committee working behind the scenes at the present time and most of the areas involved are being done by committee members (i.e. volunteers, boxes, box storage, excel inventory spreadsheet, schematic/set-up, purchasing manager, and much more). Some favorable major changes are happening so if you are interested in learning more, we would love to talk to you. The clothing drive is slated for Saturday, October 20th. Since planning is ongoing now, the need for a Chairperson is fairly urgent. It sounds like a huge task but thankfully the team works so well together — you won’t be alone, we promise! Contact clothingdrive@womenqc.com if you are interested in learning more or if you have questions. Discover Quail Creek Event – Thank You, Members! A big thank-you to TWOQC members that volunteered at the Discover Quail Creek event at the clubhouse last Friday. This opportunity allowed our members to hand out brochures and inform interested women about TWOQC’s mission, what we do and how many organizations we support. Members participating for the day were JoAnn Haberer, Yasmin John-Thorpe, Kathi Krieg, Diane Quinn, Pam Rodgers, and Angie Werner. Also, many thanks to Carol Mutter and Marianne Cobarrubias for meeting with Gil Lusk to assist in arranging this function for all Quail Creek clubs to participate. “Thank you” to this week’s FMM contributors: Laura Colbert, Kathi Krieg, Jeff Krueger, Peggy McGee, Carol Mutter, Diane Quinn, Kay Robinson, and Julie Woodard.